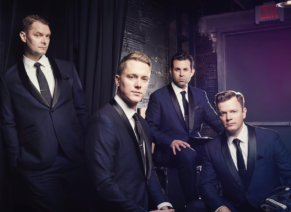 — recent leading cast members of the Tony Award-winning musical Jersey Boys — deliver an evening of unforgettable entertainment. You’ll hear Doo-Wop, Motown, old time Rock ‘n’ Roll and all of your favorite songs from The Drifters, The Beach Boys, The Beatles, and in a “show-stopping” salute to their mentors Frankie Valli and Bob Gaudio, the guys perform a medley from the “Four Seasons” catalog of outstanding hits. Critics have called Under the Streetlamp “a sure-fire sellout!” All the songs are delivered in the inimitable Under the Streetlamp style, with tight harmonies and slick dance moves that will take you back an era of sharkskin suits, flashy cars, and martini shakers.